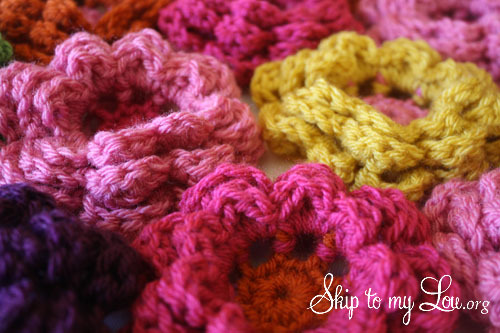 These crochet flowers are super simple to make! I used Lion Brand Vanna’s Choice yarn and a crochet hook H.
I hope you can understand the instructions. I would love your feedback or any suggestions on wording for the pattern. 2nd round – chain 4, *skip 1 sc, dc in next sc, ch 1, repeat from * 6 more times. Join with slip st in 3rd chain of first ch 4. Tie off color. 3rd round – join new color to first chain loop with a slip stitch, work sc, dc, trc, dc, sc in each ch 1 loop, making eight petals, slip stitch in first sc. 7th round – sc, dc, 3 trc, dc, sc in each chain 4 space around. (8 petals) slip stitch in first sc, fasten off. In no time at all you you can crochet a garden! These flowers are great on scarves, hats, pins, headbands…….. 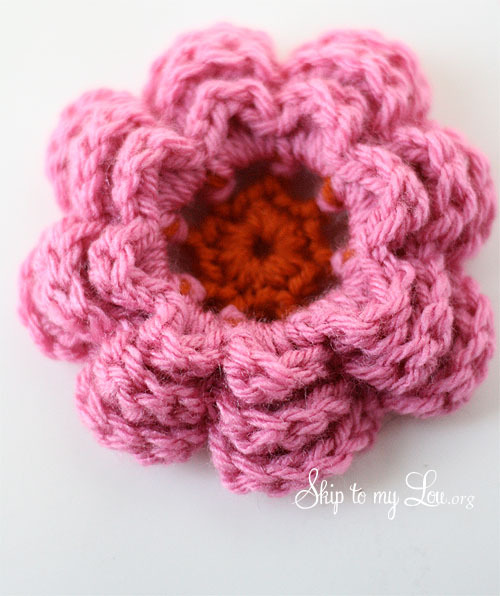 This crochet flower would be a great embellishment for one of these crochet hat patterns. If you love to crochet be sure to check out all the beautiful free crochet patterns. You can even upload your own crochet patterns! In round 4, I understand that you go around the post of the dc from the back, but am I supposed to do sc, ch 4, sc and then sc before chaining 4 again? Thanks. I think I made it right, but I decided to re-do it with a smaller hook, as it was too big with the J hook I used. I'm gonna try it again later today. I had a bit of a hard time understanding the pattern at first but once I got, wooooowwwwww. I LOVE this flower pattern!!! its so pretty and fluffy! and is now is to make since doing it twice. Thank you for sharing your pattern with us!! I used a G hook and my flower measured 4 inches across the front. The flower appears much smaller to me at least in your picture. If anyone makes a video that would be great. I made it to the 6th round, round 4 was explained but unsure if I did it right. I'm going to try round six. Hopefully it looks good when I'm done. I believe you are missing a sc (after the 2nd dc) in row 5. I am new at this, and i am having a time with this flower! Help! Do you have it on video? Do you have a video to make these? I love them, I just need a visual of each step. Thanks! Just finished my flower. Thanks so much for putting up this pattern! I found it on Pinterest and I'm delighted with the finished product. I haven't made flowers yet. I can't wait to try these out. Do you plan on making a video on how to make this flower? I was able to follow the pattern to the point of finishing round 3 but couldn't figure out from there(new to reading patterns). I learn quicker and easier from watching someone demonstrate this is the only reason I ask. Thank you. I love these flowers! I just made a blanket for my daughter, and these flowers are the perfect touch, she loves them because they are pretty, I Love them because they are eash and quick to make. Perfect! Exactly what I was looking for to embellish chemo hats I've been making. I made them with a pin backing so they can be mixed and matched. A great stash buster too! This flower is so cute !!! Is there a video on it?? Erin, I am going to work on one! what does the A mean in the directions of the how to crochet a flower tutorial? Yes, in the 5th round, there needs to be another sc after the second dc. I'm having trouble understanding "Working behind sc ch 4 around each dc in 2nd round,". Not sure how to do that. are there instructions on how to do that? Teri, you put the needle in from behind. I will look for better instructions. Is that meant to have a sc after the second dc... so sc, dc, 2trc, dc, SC? Loving this flower. Doing it in alternate colours for the petals. I'll post a ravelry link to the finished pic when I'm done. This is so easy! and the flower is so fluffy! my favorite flower pattern so far! OH how I love these flowers! I wish you could do a You Tube video on crocheting them - I'm a bit confused on the rounds and how they go. :-( Visual would be just perfect!! I have just recently learnt to make these flowers. Your pattern with eight petals rather then the five or six that seems usual is fantastic. It makes up into a beautiful flower. Thank you for sharing your pattern. me gustaria hacer unas sandalitas de las que hay en la foto ,pero no encuentro la explicacion. gracias. Too cool, extra cute flowers. I'm going to incorporate into the granny square afghan I'm working on. I get lost after row three. Is there a video or more pictures to follow. I really appreciate your posting this pattern and would love to make these. It does look like round 4 means to work behind the petals you created. sc around the posts of each petal. You created these dc posts in round d 2 and now you'll be creating them again in round 4. So sc then ch 4 around each post. I'm also confused with round 4 and "working behind". Do you mean work behind the 2nd row ch 4 posts? I'm going to try it out and see. I'll post if I figure it out. Hello, I got up to step 4 and then was confused by what "working behind" meant. If you could give me an example that would be great! :) I'm trying my hand at different flowers to put on the earmuff headbands I've been working on. What a pretty collection of flowers. The picture gives a very good of colours to be used. I like the fact that they give the effect of looking into the flower rather than the usual flat type of pattern. I love these, but I'm confused when I get to 4th round. Is there a video tutorial that I can watch. I want to learn these. they are so cute. I'm just learning to crochet and I'm struggling a little bit. thanks! Thanks! I just made a 3 color one for a earwarmer. Too cute! Love these flowers for ear warmer wraps - prettiest flower I have found and my teenage daughters approve! Please do not move this pattern or I will be sunk. Thank you so much for posting the video, I also had a difficult time following the pictures and diagrams. I finally completed the flower and I love it! Thank you for posting the pattern. Thank you for the pattern! I just taught myself to crochet recently, and making these flowers was the main reason I wanted to learn, so I was pleased that I was able to do your pattern. I think there might be an error in the pattern on row 5, though. Your pattern calls for sc, dc, 2trc, dc, in each chain 4 space around; but the other petals are made by sc, dc, trc, dc, and finishing with a sc. Should row 5 be sc, dc, 2trc, dc, sc in each chain 4 space around? Thank you for sharing. I am a total beginner and my flower turned out perfectly! Crochet Flowers catch my attentions when i see your article. Very..very charming and hope to have one to pair with my dress. Thank you! I was looking around the web for flowers for a baby blanket I plan on making. These are lovely. WooHoo!!!! Thank you so much for your generosity. Every time I go into the craft store I just cringe at the cost of the crochet flowers especially because I crochet and knew I could do them. 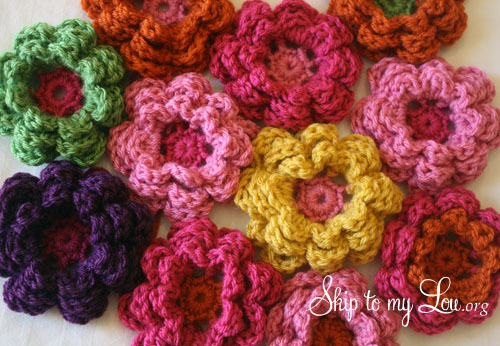 Ran across your blogsite and instructions and pulled out my yarn and just love these flowers. Can't wait to add them to my various projects - I just love this multi-layered flower - it is my favorite. Again, TFS! I couldn't believe how quickly these stitched up! These are so stylish and will look cute on anything. This one I just finished will adore my niece's baby hat. Thank you so much for your instructions! Thanks so much for making these patterns available. Have crotched my granddaughters some hats and these flowers will be the finishing touches. They are beautiful and your instructions are great. Thanks again for sharing. Thanks for a great tutorial! Making some of these in Maroon and White for my Aggie friends. Gig 'Em!! 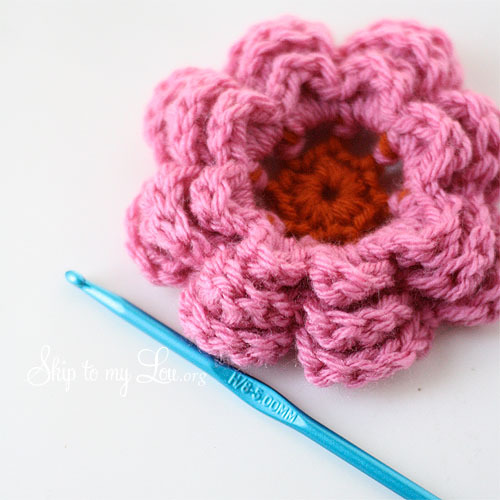 Love this cute crochet flowers tutorial. Seem very easy to make. Thank you or sharing. lovely i will try making these for my papercrafts and altered art. Your flowers really turned out great. You should sell them on Etsy too! I really want to make a ton of these and sew them together for a blanket for my 4-year-old. How adorable!!!!!!!! I'm going to learn to do this with my little girl! These are some of the cutest crochet flowers I've seen! I haven't been brave enough to try making any yet, but when I am, I think I'll use your pattern. Thanks so much for sharing it! So cute. My 2 year old daughter loves anything girly! She is going to love this! What pretty little flowers! Time to raid my yarn scraps to give them a go. I love a quick crochet project (anything bigger than a scarf takes me way to long!). Love these! I want to learn (I'm on my way) but also I want to put them on everything! Thanks for this info great for decorating my pillows.. Thanks Becky! I will be waiting to hear. Just discovered you recently and am looking forward to making these! Love making flowers too!!! Easy way to use up yarn scraps.